Japanese Knotweed is considered a nuisance plant, damaging buildings and other manmade structures. Recent changes to the process of buying and selling property mean that more and more people are having to consider whether this plant is present on, or near to, their building. The Centre for Ecology & Hydrology (CEH) has recently been involved in a project to produce Knotweed risk ratings for all British postcodes. Read on as Dr Oliver Pescott reveals more! 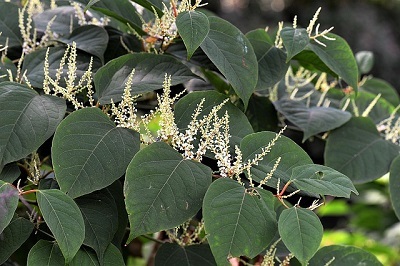 The plight of home-owners affected by Japanese Knotweed in their gardens, or otherwise near their homes, has featured in several recent news stories, for example, in the Telegraph and on the BBC. Japanese Knotweed is just one invasive non-native species that is covered by a law stating that it is a requirement for landowners to stop such species spreading on to nearby land under different ownership. This law, combined with changes to the process of buying and selling land and properties, means that it is becoming increasingly important for those involved in the property market to quantify the risk associated with finding Knotweed on their land. The BBC report mentions that “biological records”, or data on the occurrence of species (including Knotweed), from websites such as the National Biodiversity Network (NBN) may be of some assistance to people in evaluating the risk to their home from Knotweed. CEH, working with the Botanical Society of Britain and Ireland (BSBI) and the STL Group, addressed this topic using two NERC Innovation grants in 2015 and 2016, with STL subsequently launching the first “risk evaluation” products for Knotweed towards the end of the second grant. Although the BBC report was correct to point to the value of species’ occurrence data for providing information on Knotweed locations, a good understanding of these data is necessary for their effective use: the datasets available via the NBN are largely the product of volunteer surveys, or “citizen science”, and this means that data on Knotweed obtained via this route are inevitably somewhat incomplete. Such data are not low quality, however: citizen science data collected by amateur and professional naturalists, often in association with national societies focusing on different groups of plants and animals, are amongst the highest quality data available on species in the UK today. See the Biological Records Centre 50th anniversary publication for more on this topic. In order to make the best use of citizen science data on Japanese Knotweed for risk assessments, CEH worked with the BSBI, using their extensive data on Knotweed to create maps of Knotweed habitat suitability. This approach means that rather than solely relying on the partial and incomplete raw data contributed by expert naturalists, data can be combined with environmental information in a statistical modelling approach that estimates the suitability of the landscape for this species. All of the information in the data are used, and the approach means that all areas of Britain were able to receive suitability predictions based on the local environment. On the left, the recorded 20th century distribution of Japanese Knotweed is shown at 1 km2 resolution. On the right is an example of a suitability map for Japanese Knotweed at the same scale. The CEH/BSBI/STL Group approach to Knotweed risk quantification does not stop here. In order to provide the best possible risk estimate for homeowners, we then combined our habitat suitability map with the original Knotweed occurrence data, producing a two-way matrix within which all British properties could be assigned risk scores. For example, a building could be within a ‘high suitability’ zone, but have no actual sightings of Knotweed in the vicinity, such a property could be assigned a medium risk. A property in a ‘high suitability’ zone with several actual records of Knotweed known in the area might be termed ‘high’ risk. Such a two-way assessment of risk underlies the current STL Group product. This image shows an example of how Knotweed occurrence data are used in our risk model. Here, hatched squares indicated areas within with Knotweed has been recorded, some records, such as that at the bottom of the image, are known to occur with 1 km2 grid cells, others, such as the two to the top left of the image, are known at a higher resolution (here 100 m2.) 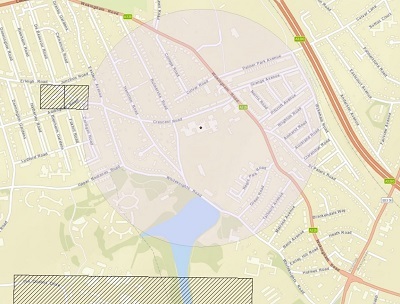 The pink 500 m radius is the area around the central property that is searched for overlaps with known Knotweed locations in this example of our risk methodology. Here only one overlap is found. This information is combined with the suitability map to create a risk rating. The CEH and the BSBI are committed to updating the underlying datasets regularly, to ensure that home owners and buyers have access to the most up-to-date information on Knotweed available, without having to worry about interpreting raw data sources, such as the NBN, themselves. Contact the CEH Data Licensing Team at spatialdata@ceh.ac.uk for information on accessing the data.